With 8,800 acres already burned, there's still no end in sight for two wildfires in Leeward Oahu. On Tuesday, the Department of Education announced Leihoku and Makaha elementary schools reopened after flames got dangerously close to the schools on Monday forcing officials to cancel what was supposed to be the first day of classes. 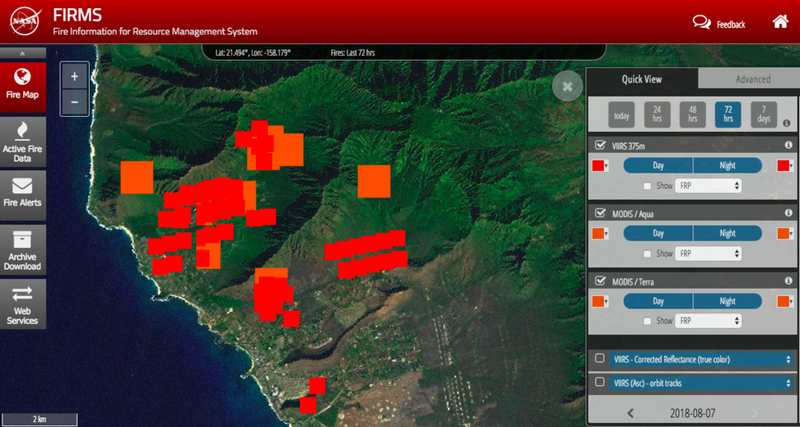 NASA FIRMS satellite imagery of Oahu fires (most current areas that are burning as of Aug. 7 12 pm). Orange and red are different satellites. NASA FIRMS satellite imagery of Oahu fires (burn areas since the start of the fires). Orange and red are different satellites. "The fuel load is very dry. It's been a hot summer. We haven't had a fire in a long time. There's a lot of fuel load out there, so all of these things are combining," said [Battalion Chief Howard] Naone. "Right now, everybody's kind of relaxed. These guys were on duty on Saturday, so they're tired, and they're trying to not rush. Rushing leads to injuries and leads to people getting hurt and bad decisions like that, so we're just trying to take our time." "We're taxing the total island of resources. Engines are coming from the windward side of the island. They're coming from town. They're coming from as far away as Kahuku to come here and fight the fire," said Naone.